2039. 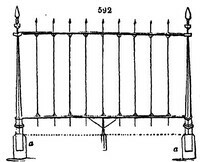 The cast-iron espalier rail (fig. 592.) resembles a common street railing, but it is made lighter. The columns or styles may either be fixed in oak or stone (a a); or, when this mode is not adopted, their base may be formed in the shape of a reversed T, setting them on a foundation of four-inch brickwork.